While I may be best known for luxurious transformations of classic, Brooklyn townhouses...every once in a while I like to switch it up for a commercial project that is willing to loosen up and play! Aimco develops modern, beautiful rental apartments in New York City’s most exciting and culturally-rich neighborhoods, providing a well-designed, easy platform for rental clients. For their Empire State Building headquarters, I had the pleasure of designing a space in one of the most iconic buildings in the world - a space that would reflect Aimco’s eclectic clientele and offer a cheerful environment, inspired by fresh air and light, and creating a healthy and productive work space for everything from broker meetings to business lunches. 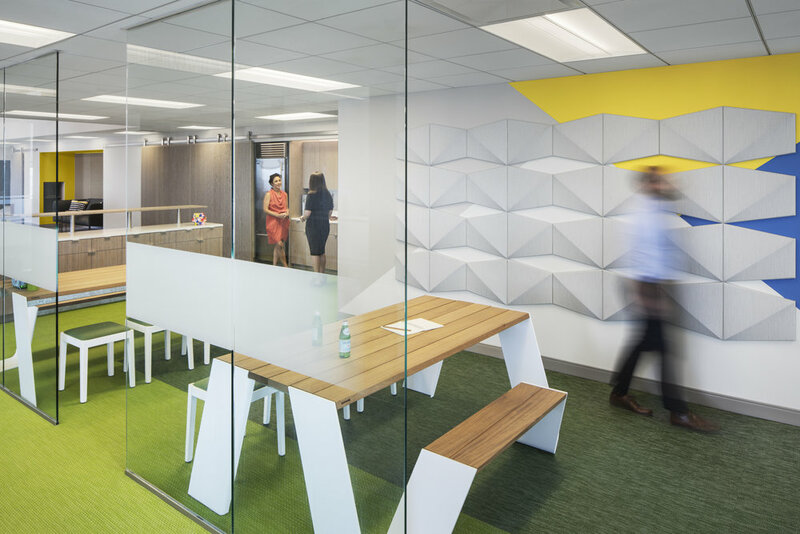 Urban-inspired materials like concrete and grass-like flooring create a certain magic that transforms a typical, predictable office into a joyful, Urban Picnic. Vibrant, textural wall-panels in sunny yellow and industrial grey provide a unique nod to the varied colors and textures of New York City, and it’s beautiful citizens. ‘Urban Picnic’ was my theme, using aforementioned materials as refrences to the buildings that surround New York City as well as the iconic parks - and modern indoor picnic benches to inspire casual and relaxed interactions. The dining area is open for movement and flow, abundant with frosted glass panels for privacy. A long, inviting table at the entrance is intimate enough for co-working, yet large enough for a focused tete-a-tete, while a bright, sunny nook at entry makes waiting for meetings a pleasure. Interior walls were eliminated for maximum access to daylight, as well as a sense of community among employees. Many studies (and common sense) have shown that such access to light and natural human interaction improves creativity, happiness, and overall sense of well-being. My design priority is always first about heath and wellness, and then about beauty. And usually you can’t have one without the other! Aimco’s mission to connect clients to each other, and to ultimately provide them a true home, is reflected in the headquarter’s creative and sophisticated use of design and materials. It’s offices like these that ensure employees have maximum inspiration, productivity and good vibes in a space they spend most of their precious week! Happy working everyone!